Welcome to the kick-off of Fear Friday! Friday will be reserved for things that make you skin crawl. 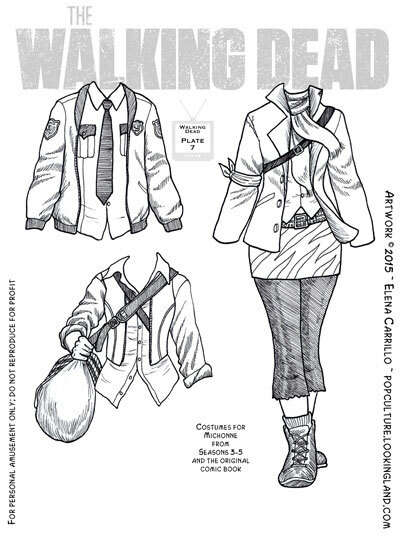 The current paper doll sets I will be posting are the last two plates of The Walking Dead and then the plates of the spin-off show, Fear the Walking Dead. Today we have a few outfits for Michonne. Of the three characters I did for this show, Michonne was the hardest to find good costume variations. I finally gave up and reproduced her outfit from the comic book series. It feels a little cheaty, but I was tired of flipping through pictures and I wanted to get this series wrapped up. On a show full of Mary Sue-ish characters, Michonne strikes me as the most Mary Sue-ish of all. I have yet to feel like she’s a real person at all (and probably never will). She’s still cool, though, and Danai Gurira, who plays her, is awesome. You can find the plate with Michonne by clicking on her tag below, or click The Walking Dead category link to see all of the plates in this series. Michonne, The Walking Dead. Bookmark.